Strengthening the talent pipeline is critical to our success as a region. We are fortunate to have one of the nation’s finest research universities right here in Tucson, producing some of the nation’s top talent. The University of Arizona is considered a top tier research institution. Many people don’t realize it, but as a company, Raytheon recruits more engineers from the UA than any other university in the nation. From our sophisticated high-tech research to our commitment to improving educational opportunities for students throughout Tucson, we work closely with the UA on a daily – if not hourly – basis. Raytheon believes the state must adequately fund our higher educational intuitions to build our talent pool to not only benefit our company, but all Arizonans. 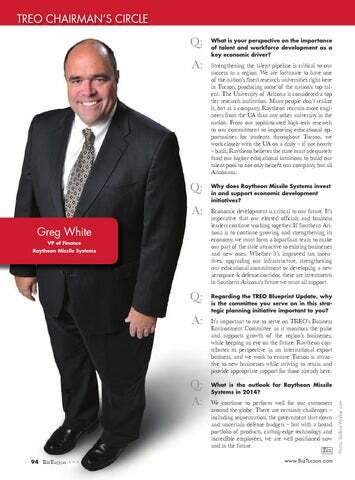 Why does Raytheon Missile Systems invest in and support economic development initiatives? Economic development is critical to our future. It’s imperative that our elected officials and business leaders continue working together. If Southern Arizona is to continue growing and strengthening its economy, we must form a bipartisan team to make our part of the state attractive to existing businesses and new ones. Whether it’s improved tax incentives, upgrading our infrastructure, strengthening our educational commitment or developing a new aerospace & defense corridor, these are investments in Southern Arizona’s future we must all support. Regarding the TREO Blueprint Update, why is the committee you serve on in this strategic planning initiative important to you? It’s important to me to serve on TREO’s Business Environment Committee as it monitors the pulse and supports growth of the region’s businesses, while keeping an eye on the future. Raytheon contributes its perspective as an international export business, and we work to ensure Tucson is attractive to new businesses while striving to retain and provide appropriate support for those already here. What is the outlook for Raytheon Missile Systems in 2014? We continue to perform well for our customers around the globe. There are certainly challenges – including sequestration, the government shut down and uncertain defense budgets – but with a broad portfolio of products, cutting-edge technology and incredible employees, we are well positioned now and in the future.